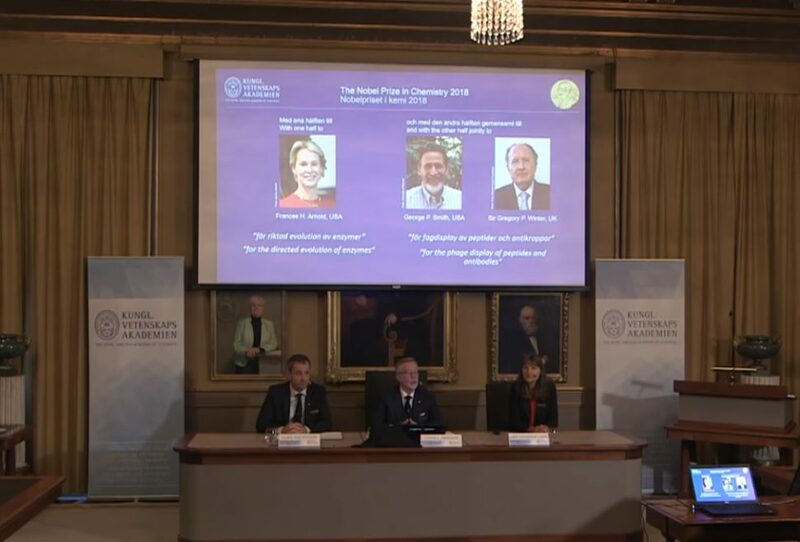 The 2018 Nobel prize in chemistry has been awarded to three separate scientists for their role in evolutionary science and disease prevention. The 2018 Nobel Prize in Chemistry has been awarded to three scientists who harnessed the power of evolution to help humankind. “This year’s Chemistry Laureates have taken control of evolution and used the same principles – genetic change and selection – to develop proteins that solve humankind’s chemical problems,” the Nobel Prize organizers said in a tweet. Smith is the Curators’ Distinguished Professor Emeritus of Biological Sciences at the University of Missouri, Columbia. He developed the phage display, a method that utilizes the virus known as bacteriophage to evolve new proteins. Winter, the other prize winner, is currently the Research Leader Emeritus at the MRC Laboratory of Molecular Biology in Cambridge. He used Smith’s phage display to create new pharmaceuticals that lead to the development of antibodies that can neutralize toxins, cure metastatic cancer, and fight autoimmune diseases. Last but not the least is Arnold who’s the fifth woman to receive the prize since its inception in 1901. She’s the Linus Pauling Professor of Chemical Engineering, Bioengineering and Biochemistry at the California Institute of Technology. Her work on directed evolution enzymes has revolutionized the manufacturing industry. “We are in the early days of directed evolution’s revolution which, in many different ways, is bringing and will bring the greatest benefit to humankind,” the academy went on to say. Last year’s Nobel Prize in Chemistry was awarded to Jacques Dubochet, Joachim Frank, and Richard Henderson for their outstanding work on cryo-electron microscopy. Do you know any scientist who deserves a Nobel Prize in Chemistry?